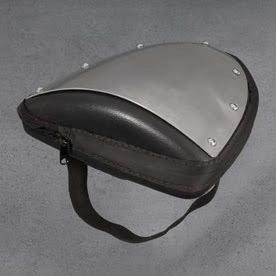 Look good with our VMAX Tail Bag. This convenient expandable storage pack attaches to either the passenger seat or luggage rack (sold separately). A concealed expansion joint allows the capacity to increase from 325 cu. in. to 450 cu. in. Made of tough, thermo-formed HDPE with a formed aluminum plate that coordinates with saddlebags and other VMAX components. View all our VMAX accessory postings.